This is a gentle moisturiser which is essential oil free, suitable for all skin types and ages, even the boys! Made using Tasmanian grown Hemp Seed Oil and Hemp Seed Extract. As Hemp Seed Oil has a short shelf life this product is only made in small batches, to ensure the freshest product is delivered to you. Occasionally there can be a slight delay on this product, it can and has sold out in the past, usually we have new stock on the shelves within 14 Days. Use: Works well on skin, all skin! Patch test in elbow crease before use. Store capped in a cool dark place, open with clean dry hands. 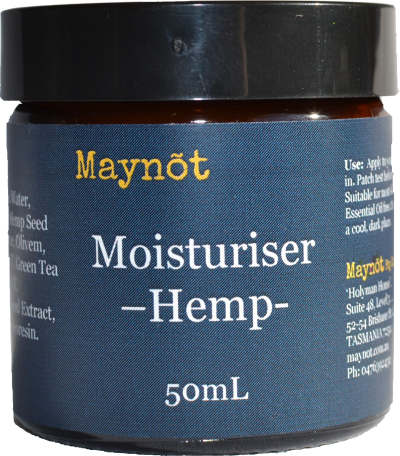 Ingredients: Water, Tasmanian Cold Pressed Extra Virgin Hemp Seed Oil, Vegetable based Glycerine, Olive Oil based Emulsifying Wax, Hemp Seed Extract, Green Tea Extract, Olive Leaf Extract, Vitamin C, Grapefruit Seed Extract, Rosemary Oleoresin, Ferulic Acid.